Evening wear - BoysDress to impress! Evening wear - GirlsFind your perfect dress! 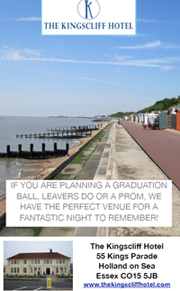 Find A VenueYou shall go to the ball! The Kingscliff Hotel in Holland-on-Sea has the facilities to host a small function for 10 guests or a large Party for over 100 guests, whatever the occasion. Our function rooms at this popular hotel in Holland-on-Sea are very versatile and traditional. We can even interconnect the rooms to allow for up to 150 guests. All of our function rooms are well lit by natural daylight. The Kingscliff Hotel Holland-on-Sea will supply you with your own Function Co-ordinator, who will help organise every aspect of your event. They will be with you every step of the way, liaising with all the relevant personnel to ensure the smooth running of your function.